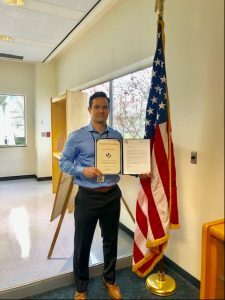 Scott DeLoera – Proficient and Knowledgeable Team Player | Veterans Management Services, Inc.
VMSI is thrilled to recognize Scott DeLoera with an Award of Excellence in support of our National Oceanic Atmospheric Administration (NOAA) contract! We recently received extremely positive feedback from the Director of NOAA’s Satellite and Information Acquisition Division (SIAD), regarding Scott’s dedication and contributions to the team. Scott’s knowledge and expertise have been invaluable to the SIAD team and he has consistently gone above and beyond by providing training to his peers. The client details not only Scott’s positive attitude and ability to be a consummate team player, but also his outstanding work ethic and professionalism in handling all assigned actions. VMSI values Scott immensely and would like to thank him for him continuous commitment to quality!